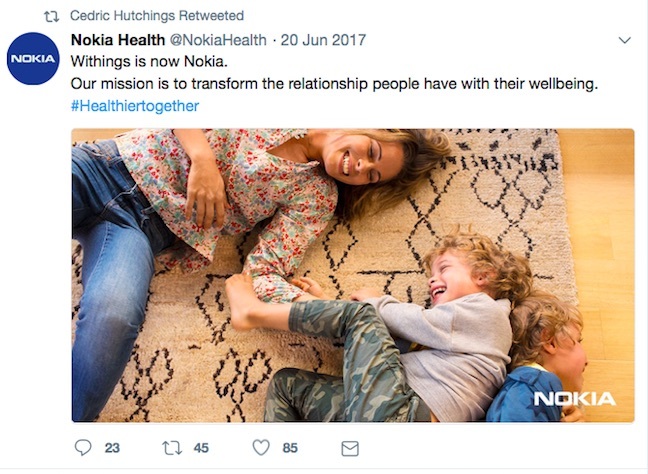 Nokia has dispensed with fitness gear maker Withings, less than two years after acquiring it as part of a bold new strategic move into digital health. Withings will be sold to Éric Carreel, who co-founded Withings in 2008 with Cédric Hutchings, who is currently VP of Digital Health at Nokia. The company heavily promotes its sleep sensing mattress cover, alongside the more familiar scales (Withings first product) and hybrid analog watch. "The planned sale is part of Nokia's honed focus on becoming a business-to-business and licensing company," the company said in a press release. Terms were not disclosed. Nokia announced a lower operating profit in its most recent quarter, with sales down 8 per cent year on year. Health contributed just €52m to overall sales of €23.2bn in 2017. But wasn't health one for the future? Wasn't it supposed to position Nokia as a data kingpin? Well, two things have changed since the purchase. In 2016, we were still experiencing the arse end of the IoT hype - which doesn't look so clever today. Wearables aren't seen as the great future platform. Although Withings' watch does integrate with Apple's HealthKit, the view is now that owning a device business by itself doesn't give you a strategic position in the health data industry. Fitbit acknowledged as much this week by signing a deal with Google, meaning that Fitbit-acquired data goes to doctors via Google. Fitbit had already been shut out of the Apple Health ecosystem. So no matter how good a brand you build for your wearable (or scales) - you're just a data-gathering sensor for the platform owner. And the platform owners, Apple and Google, have no intention of being shut out of the future data supply chain. In February Nokia took a €141m accounting charge for the impairment of goodwill relating to its digital health business - meaning it was worth less than before.